TROLLS is a very cute and fun film for adults and kiddies, loaded with fabulous music, dance, giggles and a happiness theme. I especially loved the created world where the characters and backgrounds looked like they were made of fabric, in particular...felt, tying in with Poppy's love of scrap-booking. I took my Mum and she loved it too, we fancied watching it again the very next day, so you see it's not a blokes-only film at all. The Director, Alejandro G. Iñárritu, has made some of the best cinema in recent years, including directing one of my favorite films, BIUTIFUL, with Javier Bardem, plus 21 GRAMS with Naomi Watts and Benecio del Toro. His films are unique with strong, passionate characters, and mystical elements. Academy Award®-winning director Alejandro G. Iñárritu brings the legend of Hugh Glass to the screen with an epic adventure set in the unchartered 19th century American Frontier. While on an expedition into the wilderness, explorer Hugh Glass (Leonardo DiCaprio) is attacked & abandoned. Near death, Glass undertakes an incredible 200-mile journey through a vast, icy wild West on the trail of fellow fur trader John Fitzgerald (Tom Hardy). He discovers inner strength and resilience to the brutality of man, animal and nature as he struggles for survival. Tina Fey and Amy Poehler reunite for Sisters, a new film from Pitch Perfect director Jason Moore about two disconnected sisters summoned home to clean out their childhood bedroom before their parents sell the family house. Looking to recapture their glory days, they throw one final high-school-style party for their classmates, which turns into the cathartic rager that a bunch of ground-down adults really need. In a time when audiences are well versed in the fast cut movies, with stories that start on the run and don't let up until the end, where characters change completely from start to finish and every word and scene must move the story forward and never repeat itself, BY THE SEA, really stands apart. It's a brave film, very European in style and fascinating, I really enjoyed it. If you go into the film prepared to sit back and let the story unwind slowly you just might love this film too. Where do you see Australian short films after they have done the rounds of festivals? Quality, professional Aussie movies are being made through hard work, sweat and tears and audiences desperately seeking fresh new content. I will see any film with Leonardo DeCaprio in it, especially when it's directed by Martin Scorsese and based on a real story, so I was pretty excited when I went into the cinema. The opening scene lays out exactly where the film is going, unfortunately it stays there a bit too long for me. Of course Leo gives a great performance, when doesn't he? 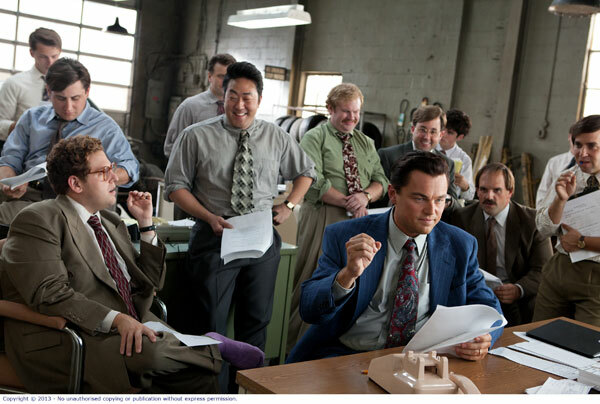 And the film is hilarious in parts, especially the overdose scene, you can see why Leo won a Best Actor in a comedy award, although Matthew McConaughey was pretty funny too. But why is it so long?